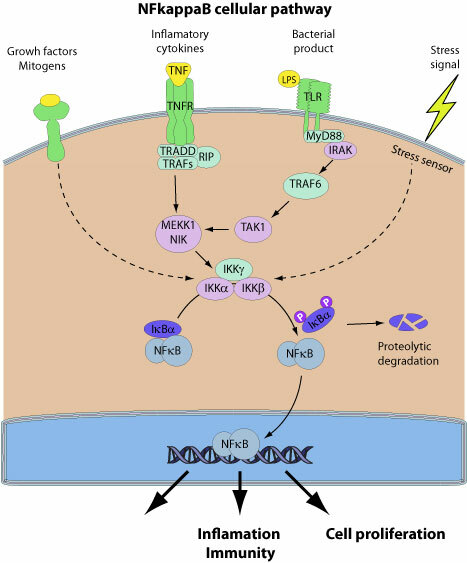 Multiple families of viruses have evolved sophisticated strategies to modulate nuclear factor-kappaB(M55643:9606) signaling: NF-kappaB activation or NF-kappaB inhibition. This host protein is a pleiotropic transcription factor which is present in almost all cell types and is involved in many biological processed such as inflammation, immunity, differentiation, cell growth, tumorigenesis and apoptosis. In unstimulated cells, NF-kappa-B(M55643:9606) dimers are sequestered in the cytoplasm via physical association with NF-kappa-B(M55643:9606) inhibitory proteins, called I-kappa-Bs. Upon activation, NF-kappa-B(M55643:9606) separates from I-kappa-B and migrates to the nucleus to activate gene transcription.